To improve the harmonious development of the feet, Zecchino d’Oro use in all the shoes a patented insole in which a hand-stitched leather footbed is applied. 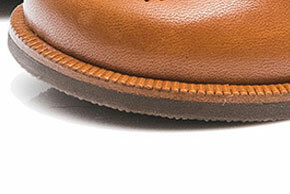 The insole can be made of leather, in the lining of natural calf or silver laminated. It is a work produced in the company to create a pleasant effect on the external part of the edge: a strip of leather provided with perpendicular decorations to the sole is applied as reinforcement between the bottom of leather or rubber and the upper sole. 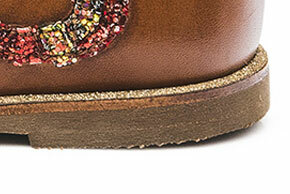 It is a technique used to remove a part of the bottom of the shoe and make it considerably more slim and stylish, as for example in sandals. Once assembled the bottom rubber or leather, the same is skillfully worked with a rotary power tool and then filled and finished to achieve a perfect result. It is a typical construction method used by Zecchino d'Oro on sports or casual articles. 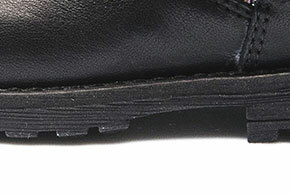 The precision of the so called “cassette workmanship”, makes a simple rubber bottom a real gem of quality and elegance. 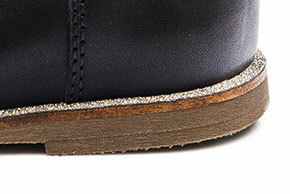 Shortly, once you remove the last form inside the shoe, the bottom is meticulously sewn directly on the upper sole. It is obtained by pasting the rubber bottom to the bottom of the last. This is the process quicker and easier to accomplish in all the work carried out by Zecchino d'Oro.